This week saw the close of London Fashion Week Men’s and we wanted to take this opportunity to cut through the glamour and the endless celebrity and street-style coverage and hold a BuyMeOnce magnifying glass up to what should be the star of the shows: the product. Fashion week is a creative whirlwind that blasts through the city in a frenzy of flashbulbs and fabulous exclusive gatherings of the industry’s elite. We want to get to the bottom of whether these collections have what it takes to go the distance. Are they heirloom quality? Is there considered craftsmanship that marries form and function ensuring these pieces will last much, much longer than a season? Can runway fashion, or any fashion for that matter, ever truly be BuyMeOnce friendly? In the beginning, most fashion shows were either haute couture events where designers would present their made-to-measure collections to wealthy private clients or a presentation of their latest seasonal collections to high spending customers, the established press and selected buyers. The collections were beautifully crafted from the finest fabrics by the very best seamstresses and tailors, but only a tiny minority of the population would have had access to the latest designs and trends. Not so in this day and age. The combination of technological advances (Snapchat previews, ‘Tweetwalks,’ live streaming) and the need for big brands to engage a wider (read younger, tech savvy) audience means the industry has experienced extraordinary evolution. Gone are the days when only a privileged few could witness first-hand the latest trends and engage with fashion tastemakers. We have to ask, however, whether these runway items in their original form are worth the hype. Are they investments? Are they beautifully crafted? Could they truly last? The answer is a mixed one. There are eccentric, outlandish collections out there – expressions of a cultural movement that not everyone could or would carry off. But while these might seem ridiculous and not at all wearable, they should be celebrated for their extraordinary creative spirit; they are essentially pieces of wearable art. If we cast our discerning eye a little closer, I believe the answer to the above three questions is a resounding yes. That is not to say that we should purchase exclusively from the runway – that would be absurd and financially unrealistic. But I do think it’s important not to dismiss these fashion moments as frivolity or indulgence of trend. There are real gems with multi-generational staying power to be found here. Barbour is a familiar brand to many of us; rooted in British outdoor heritage, their designs are practical and desirable although not immediately associated with cutting edge fashion. Barbour International, however, is a different story. A stand-alone brand created by the grandson of Barbour’s founder, they take their inspiration from motorcycle wear with pretty awesome credentials. Their original designs were specially made for motorcycle trials teams and worn by none other than Steve McQueen. Biker influences remain strong today – look out for details like diagonal chest pockets (originally for carrying maps!) and buckle strap closures – but the designs feel fresh, modern and relevant. This collection is a study of key outerwear shapes such as quilted jackets, parkas, wax and bomber jackets, which have been perfected and refined. High-performing fabrics like waxed cotton (intensely durable and water-resistant) and lightweight water-resistant nylons make up most of the collection. The brand hasn’t been reinvented so much as evolved for the modern customer. What’s always been brilliant remains: an uncompromising quality of cloth and construction. Yet the offering now speaks to a broader range of customers with a common desire to invest in something that will perform, last and look great in the process. Barbour tells us, “Rewax your jacket and like a faithful friend it will remain with you for a lifetime.” I’m not sure there’s much more we need to know! Phoebe English is a British designer with an established womenswear line – this is her second season showing menswear. The focus of English’s collections is practicality and freedom of movement or the garments’ ability move in harmony with the wearer. To illustrate these key functions, English presented her AW17 collection in action. Models on stage were either on bended knee sweeping or attending to ironing and other mundane household chores. It was a demonstration of runway fashion in a slightly bizarre context as well as a brilliant tongue-in-cheek reference to gender stereotypes. The overall vibe of the AW17 collection is quietly masculine with functional separates working together; loose single breasted coats, bombers and hooded jackets are teamed with relaxed cotton joggers and wide trousers, giving a look that is casual yet refined and understated. The palette is earthy and appealing. Stormy blues mix with gunmetal greys lightened by taupe and stone – you could easily imagine wearing these pieces year-round. English calls her work “a mindfulness of functionality over decoration.” Instead of creating a stream of peculiar statements, she perfects her craft by using traditional techniques and “raising respect for construction” by working only with natural cloths made entirely in the UK. These garments are made to be worn, loved and used, not just photographed. Watch this space for her womenswear collection coming in February. Christopher Raeburn is a fashion genius. He champions upcycling, recycling and repurposing in all manner of iterations. Yet another man after our hearts. He sources fabrics that have lived previous lives serving quite different purposes and reimagines them in wearable form. Check out his REMADE line which features pieces made from army surplus garments. He also shines a light on sustainable design – never before has the industry paid such attention to the life of a collection beyond the current season. It’s exciting to watch, particularly when the product is this good. Impressively, every item in this collection comes from either recycled or organic cloths. The opening outerwear looks are crafted from original British military bomb disposal suits, and the beautiful camouflage sweaters, bombers and duffels are made from patched together Danish army blankets. Raeburn has taken the highest performing fabrics and repurposed them for the modern day. This is a collection to lust after and wear forever. The brand takes its name from war hero Private Jack White; thus, military inspiration is prevalent in the designs, but the collection offers so much more than yet another take on regimental chic. The collection has a familiar, comforting quality to it; jacket and coat silhouettes are soft on the shoulder and generous through the body. You can imagine wearing these pieces for decades, sharing them with each member of your family (androgyny is a theme that runs through the whole collection) and loving them the whole time. Their inspiration offers heritage, but the fabric and details keep them from being old-fashioned. Huge attention has been paid to fabric. Each cloth is sourced from the UK, and longevity has clearly been in the design team’s mind during development. Fabrics are double woven and double faced and there is even a ‘ripstop ventile,’ a special type of cotton that is ultra-lightweight yet strong and resistant to tearing. The entire collection is handmade in Manchester. It’s rare to find a brand that will hand-finish let alone make entire garments by hand these days; we celebrate and applaud this return to slow craft and, dare we say it, slow fashion. It’s a brave approach to take in an industry where trends fly in and out at least four times a year. Private White VC, we salute you! These are just some of the incredible brands trailblazing the path for sustainable fashion. There is, without doubt, so much more work to do. The perils of cheap labour, fast fashion and unthinkable wastage are still very real threats. 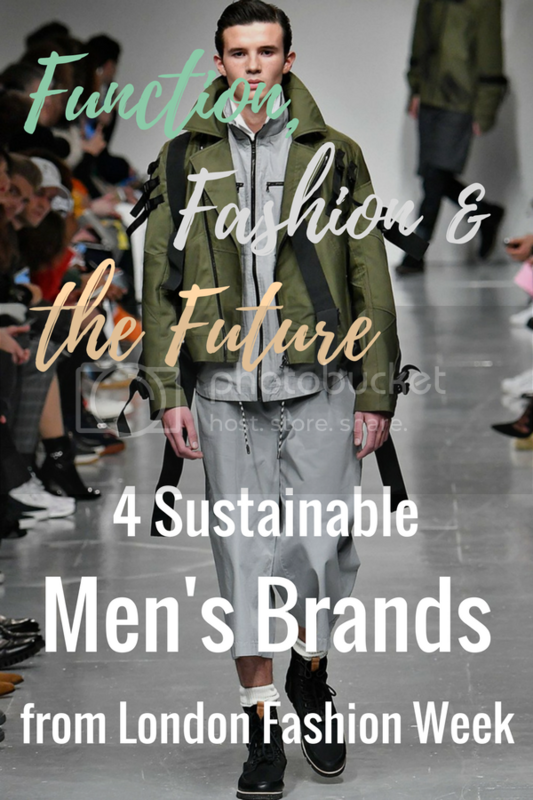 That said, the creativity and innovation of the fashion world is something to be proud of, particularly when there are brands leading the way marrying perfected craft, form and function in a way that celebrates the planet too. Runway fashion is not for everyone, and yes it is undeniably expensive. But there’s no reason why you can’t care about the planet and fall in love with fashion too. We’re really encouraged by the industry’s initiative to turn their attention away from fickle trends and instead craft perfected functional designs that work with our busy, complicated lives. Pieces that we can own, love and wear for years to come.